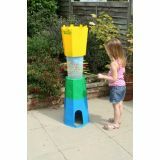 Standing 1.2m tall, this brightly coloured game is based on the design of a castle turret. "Cannonballs" are suspended in the air supported by coloured straws. Remove the straws one by one and watch the balls fall down inside the castle tower. The winner is the player with the least balls at the end of the game. Height when assembled: 120cm. Box Measures 34cm x 39cm x 34cm. Suitable for 2 and more players. Ages 4 and up. Being equiped with a clear liner allows a view from the side to see all what is going on! 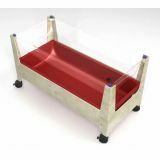 Includes white plastic lid with a stability system with wingnuts to secure the liner and lid. Massive storage underneath! Comes with four 3” locking casters. Assembly required. Measures 46"L x 21"W x 24"H.
These wooden Giant Dominoes can be played indoors or out. 28 Solid Wooden Dominoes with coloured dots. 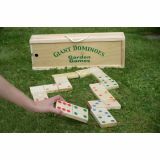 Each of the solid wooden dominoes measures 13.5cm x 7cm x 2cm thick and have coloured dots. They come packed in a wooden box with a rope handle making them an excellent gift. Each domino measures 13.5cm x 7cm x 2cm thick. Suitable for 2-4 players, Ages 3 and up. Modeled after ergonomically-minded office furniture, this bench provides superb lumbar support. Made from RSP (Recycled Structural Plastic) - 100% recycled plastic. Stainless Steel hardware. Seat is 10.5" high and back is 22"H. Ages 2-5. There's massive fun to be had with this giant party game for up to 30 players. Throw the two giant inflatable dice to find out which part of your body to place on which colour flower. Get Knotted up with the other players to make the game more difficult for them. But beware, fall over and you're out of the game. Includes 3m x 3m Playmat, 2 Inflatable Die. Suitable for 2 and more players. Ages 3 and up. 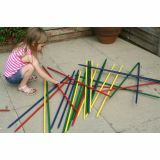 This new and improved set includes 30 coloured wooden thicker wooden pick up sticks and comes in a canvas carry bag allowing this game to taken to any chosen playing location. The handy bag also allows you to store the pickup sticks safely when the game is not in play. You will need a steady hand and nerves of steel to play this giant game. Remove each stick in turn without moving any of the others. Points are scored for each stick removed, with the different coloured sticks worth different points. Each of the 30 wooden pick up sticks measures 0.9m and have a diameter of 16mm making them thicker improving quality and playability of the game. Suitable for 2 and more players. Ages 3 and up. Players themselves act as the counters in this garden version of the classic game and move up the ladders and down the snakes on a 3 metre square plastic mat. With a giant inflatable dice to determine your score, this is an all round family game. The mat comes complete with eyelet holes and pegs to keep the game fixed to the lawn. 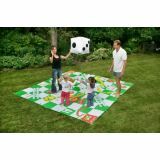 Durable and substantial, this giant version of snakes & ladders really allows you to become part of the game. It comes packed in a compact 30cm square colourful box with carry handle. Able to wiped clean so it looks new for longer. Measures 12.5"L x 11.5"W x 3.25"H. Suitable for 2 and more players, age 3 and up. Build the tower, then take turs to remove a piece and add it to the top without making the whole tower tumble. Giant tower starts at 36" and builds to 60". Includes 58 renewable resource pine blocks. Each block is 8.25"L, measurs 21cm x 7cm x 3.5cm. It also weighs in at less than 20kg. Suitable for 2 and more players. Ages 3 and up. Inspire children to get creative in the mud kitchen. With lots of muddy recipes to choose from, including a Gruffalo stew, seafood platter, and the classic mud pie. 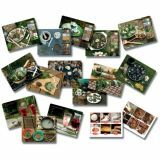 Each card includes beautiful photographic images on one side with activity prompts, vocabulary and extension ideas on the reverse. Made from durable plastic, any muddy splashes can be easily washed away. Each set includes 16 double-sided cards measuring 8"x 11”. Age 3 and up. Children are always collecting treasures they find - pine cones, leaves, moss, rocks, twigs, etc. This bowl creates a perfect space for them to gather their collections and have rich tactile experiences. There is a drain plug in the bottom of the bowl. The lid (with handles) protects fragile creatures or treasures in the bowl. Connect your children to nature with this Nature Bowl. 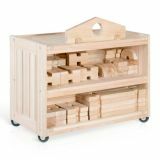 Transport your Notch Blocks inside and outside the classroom easily with the spacious, durable Notch Blocks Storage Cart. Barrel bolt construction keeps the wide, solid wood cart sturdy when holding all your Notch Blocks. Features freely rotating, u-bracket casters for easy movement in any direction. Cleats on the top of the cart provides additional piece storage. Ships ready to assemble. Notch Blocks are not included. Store in a cool, dry place. Measures 32.5” W x 18” D x 29” H.